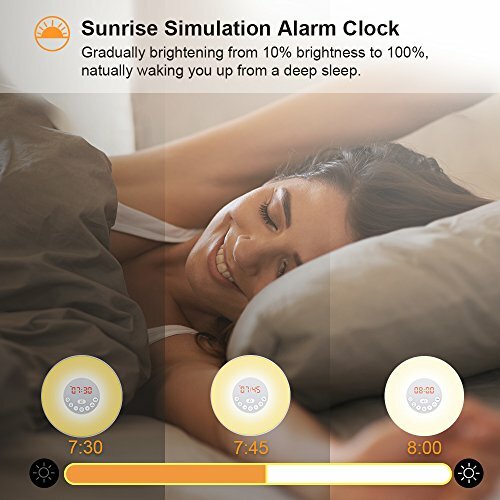 2017 Newest Alarm Clock adds Smart Snooze Function and Touch Control, gently touch the Snooze button to directly enter the snooze mode, which will leave you 5 more minutes sleep, and play again after 5 minutes and last for 2 minutes. 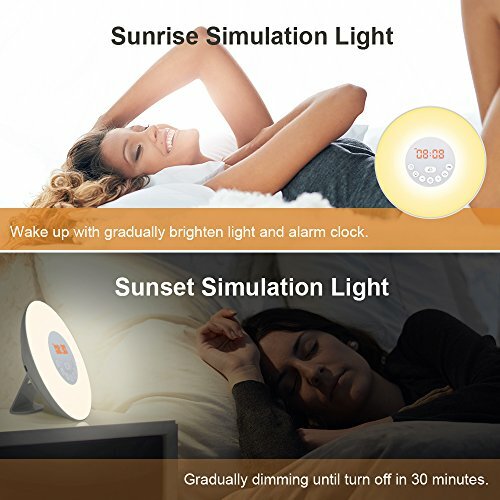 Sunrise Simulation: Just like sunrise, the wake-up light brightness gradually increases from 10% to 100% within 30 minutes prior to your alarm time. The light intensity increasing process stimulates your body to wake up naturally and refreshed. 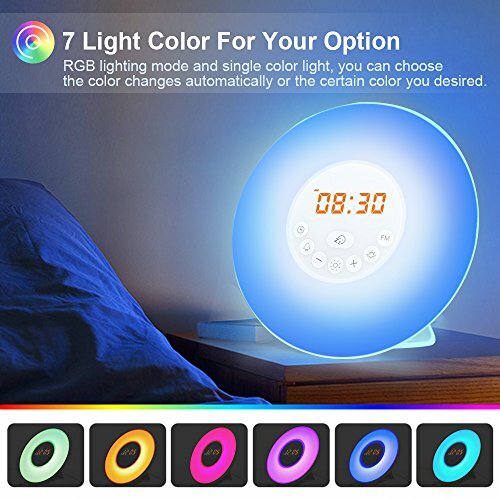 Multiple Colors Night light&Atmosphere Lamp: 7 colors for your choice-warm white, green, red, blue, purple, orange and indigo light. 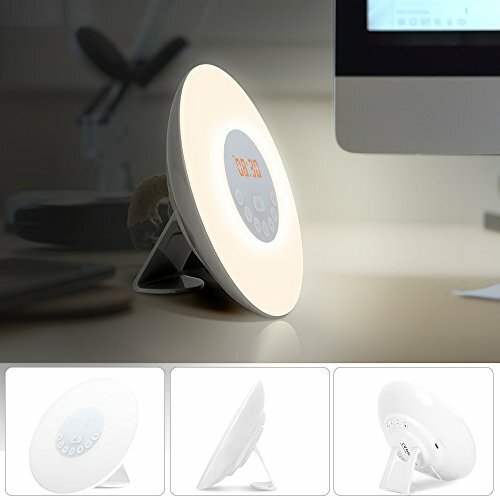 It works as LED desk lamp with 10 adjustable brightness . 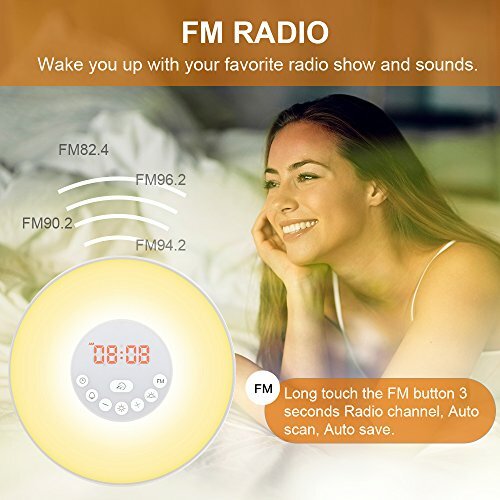 6 Natural Sounds & FM Radio: The sunrise alarm clock light offers 6 natural sounds (piano, violin, bagpipe, waves, birds and "DiDi" ), Also you may set your favorite Radio station as the 7th wake-up sound. 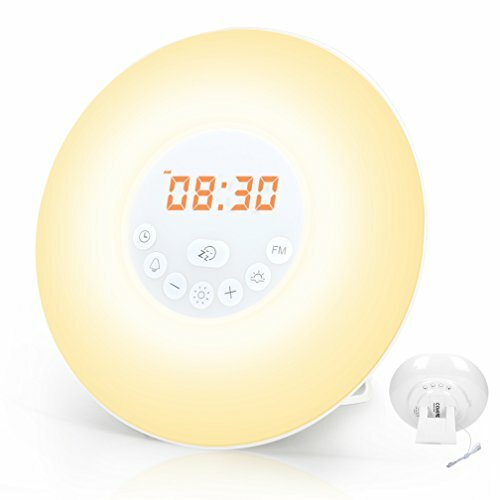 Multifunctional touch control light powered by DC 5V outlet or 2*AAA batteries, serves as bedside light, night light, atmosphere light, alarm clock and FM radio. Pls note there is no light function when only batteries operated. Choose it on Prime Day! 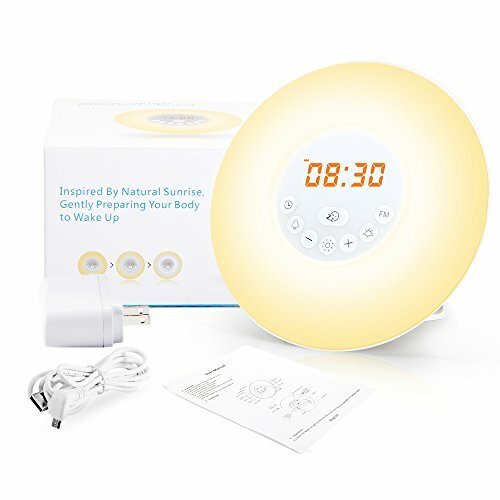 Are you looking for a gentle and effective alarm clock? 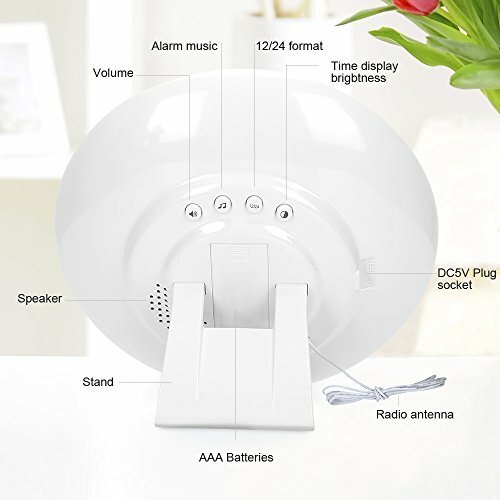 Do you feel sleepy and depressed when suddenly be scared awake by irritating alarm sound? 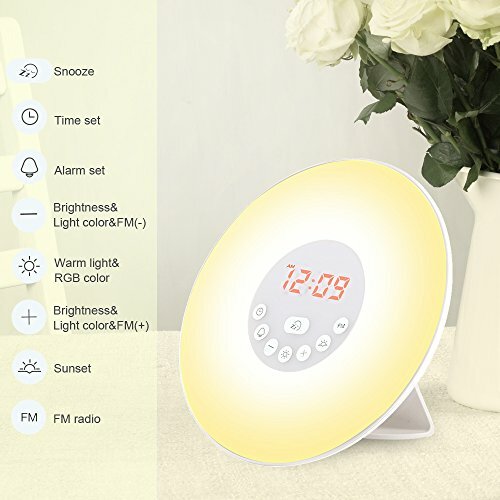 The Wake-Up Light alarm clock leaves you with an improved mood and energy level throughout the day. Wake-up Light is clinically proven to be effective, waking you more naturally and leaving you energized and in a better mood. A perfect gift to your families and friends! Provide a pleasant start for their day! 1. When powered only by 2*AAA batteries, there is No light function, and time display will automatically disappear in 5 seconds. You can press any button to resume the time display. 2. Time resetting is necessary when you use it for the first time or there is a power failure. 4.If you don't want to hear alarm sound in the morning, choose the silent option. You will wake up naturally to the morning light. 5.Please kindly contact us through your order tab or mail at [email protected] if there is any question, issue or suggestion. Our customer support team will give prompt response within 24 hours.